Once upon a time I was a single girl living in Hermosa Beach in Los Angeles, California. LA is where I met the husband, got married and then had one precious baby boy named Greyson. We moved from Hermosa to the Central Valley of California just 3 years ago. It's kind of like Spring Break all the time in Hermosa. On occasion during the weekend I found myself attending an organized pub crawl. They began early, often around 11am and went until the wee hours of the night, although I never was able to make it that long. I'm not a big drinker. You would bike with a group of friends traveling together from bar to bar. And that's exactly what I did tonight... except instead of bars, I went from grocery store to grocery store. Yes, that's what I did with my 2-hour babysitting window. I went to 3 grocery stores in all. It was just like a pub crawl in Hermosa, but instead of riding my bike, I drove. And instead of getting sloshed, I got groceries. And instead of looking cute, I was sweaty and unshowered. And instead of being surrounded by friends, I was alone, yet happy. Bob Dylan was right... The times- they are a changing. And here I am now, simmering in my so called life. I'm wondering what I did to deserve it so good. And I'm grateful that this moment is perfect and even more grateful that I have the ability to recognize it. Enjoy every moment is not something that will be muttered from my mouth. Some moments are forgettable. Some moments are painful. Some moments deserve do overs. I think the key is being able to recognize the outstanding moments as they play out. Give them a standing O and ask for an encore. They will come back around. Sometimes God reveals the world to us in layers. I usually think I want to see it all at once, but God knows best. The layers don't always make sense until we see the big picture. Sometimes the big picture takes months or days or years or even a lifetime to make sense. Don't wait for the big picture. Enjoy your current birds eye view. If you haven't yet- please read the People are Good post written last week. I shared that post with the folks working for the City of Fresno...and last night I was humbled and touched to receive one of my favorite emails ever. This is Frank, your City of Fresno green waste driver. I had to let you know that my boss did make it a point to make sure I received your beautiful story, and how touching it was! You are so right when you said "you have no idea the impact you have on a Wednesday". I truly had no idea. Your story moved me to tears as well as many others throughout the City. Words can't express how it touched my heart and how it brightened my day. Also, your pictures are outstanding! You seem to catch the very essence of life. I think I will print out the picture of Greyson sitting in my truck and post it up in the cab, to remind me every day how precious life is. With so much negativity in today's world, experiences such as these are so uplifting. My wife and I took the time this evening to go to your blog site and read about your son Greyson and your wonderful family. 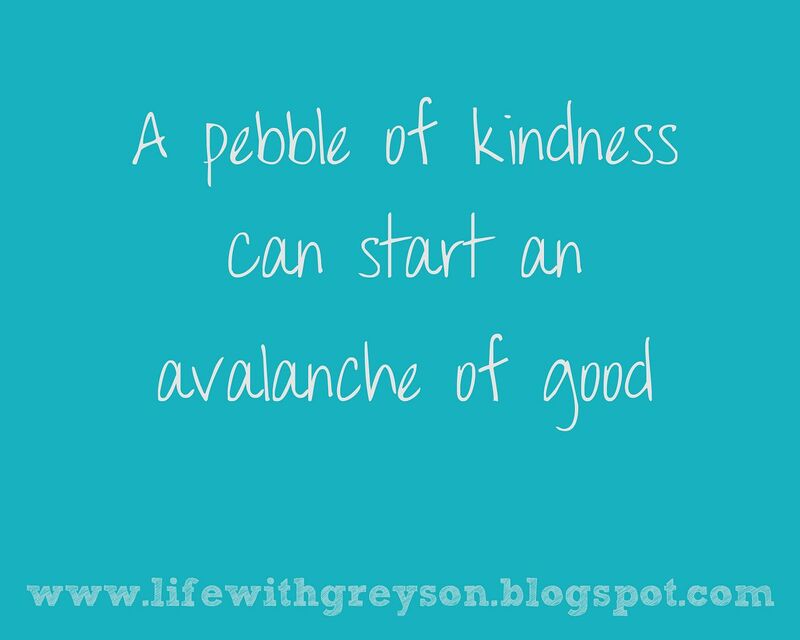 I can tell that Greyson & Parker, have such a wonderful, special mom and dad and you have two special boys! Like you mentioned in one of your blogs, they truly are Gifts from God! Even though this imperfect world hands us challenges that we don't ask for, our Heavenly Creator can help us meet those challenges as long as we rely on him for that help, he never expects for us to carry the load on our own. As long as I am the green waste driver for your area, I will continue to look forward with expectation every Wednesday to see Greyson's smiling face. And Friend, it's just so good it hurts. All of it... At the time Frank thought he was making one little boy and his Mom happy, but over 7,000 people read the post and were touched by his gesture. We all have that ability to impact a life, we just don't always get to see how it plays out. There's just so much I want to say to you about the beauty in the world that my words get all jumbled up and my throat gets tight and I just want to cry. God creates direct paths to people we are meant to meet. Opportunities for us to inspire and be inspired by. It's so easy to go through life choosing to look down and just going through the motions. I wonder, has life always been this painfully beautiful, or am I just noticing it for the first time? Today, look up. Engage. Every person can be an opportunity to connect. Be open to the gifts that are being sent your way. You deserve it. And like Frank said, know that whatever load you are carrying- you don't have to do it alone. Come connect with me on Facebook. That's all. And I love you. Oh wait, one more thing- when I went to upload my pictures for tonight's post- my card reader and camera card broke. I'm working through it. I'm deep breathing. I'm practicing not sweating the small stuff. I stink at it so I am PRACTICING. I didn't say I was PERFECTING. Thank you for letting me be one of your stops for your grocery crawl. So good to see you! Thank you for starting my day with such wonderful thoughts and words. Will be mindful of sending out pebbles. Love Frank! This blog has given me so much hope and inspiration regarding my own son. I read it daily and am always so touched by you writing and your beautiful boys!! Thank you! All of this - just beautiful. I'm so glad I found your blog. So, so glad. How awesome. This is really what life is all about. Thanks for the reminder. Frank's letter made me cry because it is yet another reminder about all of the good in this world that is so often overshadowed by so much negative, tragic, and depressing news. Loved it! Thanks for starting out my day in a fantastic way. Now we have to pack for a 12 hour road trip with our 5 and 7 year old. Have a great holiday! So touching. Amazing how things get shared so fast. To think of all the lives that are now touched from one seemingly simple gesture. How it can mean so much and now to get shared and shared and shared. Love your analogy. The tears are streaming down my face. AMAZING!!! Love that guy, Frankie and his sweet wife! Put that email in a book to read over and over...especially on those days that you need the extra love. I am so hooked on your blog...I don't know what mesmerizes me more; your words or captured still moments. I feel a deep need to read your words daily...for myself and my own two boys. I'm trying, just like you. One day at at time. You're right, it's not the big picture...It's all those moments to lead up to it. Thank you, Chrissy, for the love you share with all of us and the constant reminder of keeping life real and true to ourselves. Oh man, this brings tears to my eyes. How awesome that he emailed you. I would consider that one of my favorite emails too. Hope you all have a happy 4th. Oh, Chrissy. Sometimes small acts of kindness and love are so BIG that they can't be contained in a heart, in a moment, in even one life. 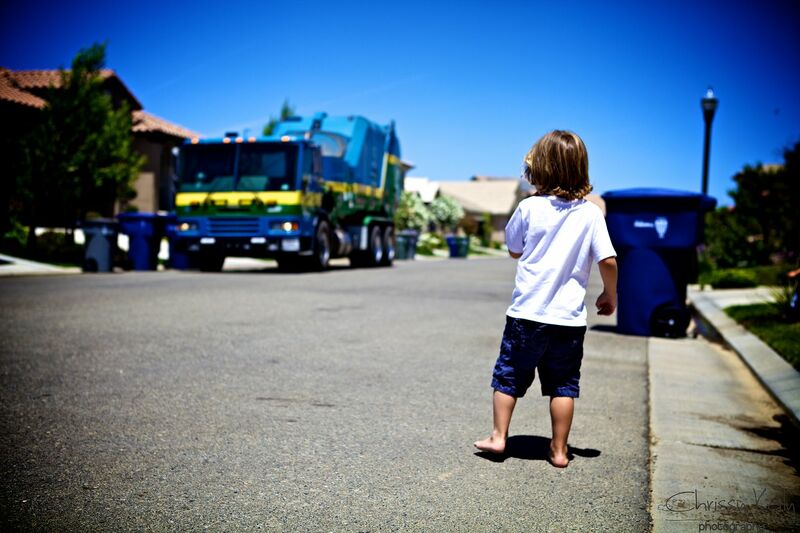 Such is the story of Greyson, Frank, and the Wednesday green waste truck. I LOVE that God chose to bless your family, Frank's family, and all of us - AFTER your guest post, when so many more were watching and listening. Our little seven year old friend's leukemia relapsed yesterday after only a couple of chemo-free months. Her name is Lola. Our hearts are re-broken, re-shattered, and I've been searching the morning for good news and small mercies. This was a particularly fitting day to receive the blessing of this post. Drinking it up. This is all just so *good. * Thank you! Amazing!! Thank you. Thank you. YEA!!! WHAT A GREAT WAY TO MAKE SOMEONE FEEL SPECIAL!!!!! Tears running down my face! What an amazing post! Thank you for everything you do! I have officially read every single blog post since I googled Autism and I am so thankful to have clicked your link. I don't feel so alone and scared anymore. You have been such an inspiration to me and all I can do is say THANK YOU!! Your boys are so beautiful, I always look forward to seeing their pictures. Whether it's Greyson jumping and running or Parker in the pool, they're both so amazing in their own ways!! Thank you! You have a wonderful family Chrissy!! !